With a big question mark still looming over this year’s school funding plan, on TuesdayPennsylvania Gov. Tom Wolf presented his education budget vision for next school year — doubling down on his ambitious agenda. 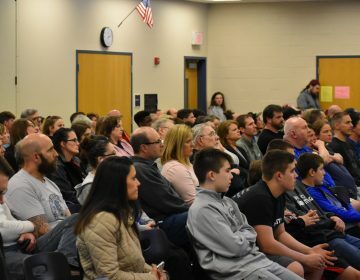 Since the last budget address, a year of negotiations with the Republican-held State House and Senate have yielded none of Wolf’s education funding priorities. On Tuesday, that didn’t stop the governor from calling for more. During a budget address that was short on specifics, but long on contempt for Republican lawmakers, Wolf warned that further stalled negotiations would lead to continued downgrades of credit ratings, more local property tax hikes, and worsening school services. “Thousands of teachers will be laid off. Guidance and career counselors will be handed pink slips. 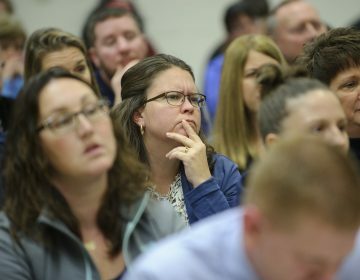 In all, more than 23,000 education professionals will be immediately yanked out of Pennsylvania’s schools,” said Wolf. In total, between this year’s unresolved budget and next year’s, Wolf proposes a $677 million boost to basic and special education spending. The $200 million called for in this year’s basic education line would be driven through the student-weighted funding formula proposed recently by a bipartisan legislative funding commission. 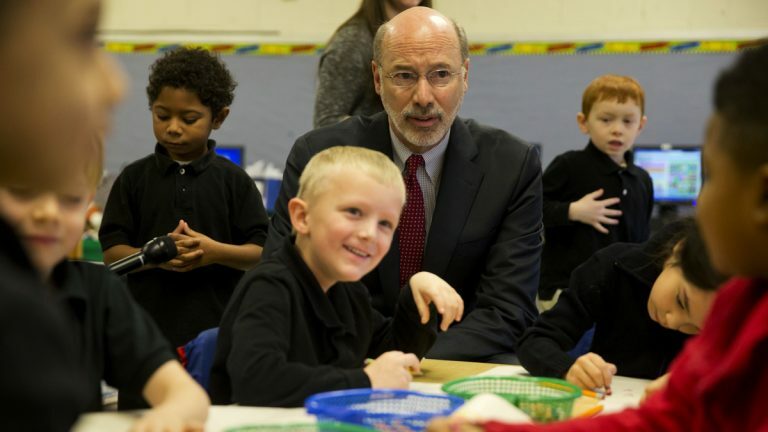 Between this year and last, Wolf also called for a $120 million boost to early childhood education, and 5 percent increases over two years to community colleges and state and state-related universities. Wolf proposed a $15 million boost for the establishment and expansion of high quality career and technical education programs; $5 million for new equipment for these programs; and $8 million for college and career counseling. Many education advocates contend Wolf’s funding proposal needs to be even higher in order to give districts the resources they need to ensure that students can meet the state’s academic expectations. “Pennsylvania has the largest funding gap between the wealthiest and poorest schools in the U.S. It has some of the widest economic, racial and ethnic achievement gaps in the country. Wolf’s plan also looks to reap $240 million in savings by reforming the charter school sector. Wolf would adjust the way charters receive funding for children with special-education needs, reduce payments to cybercharters, end the pension double dip, and require charter schools to send back unassigned fund balances to districts. Charter advocates decried Wolf’s proposed reforms. “Regardless if a student attends a public charter school or a traditional public school, the governor must treat ALL students on an equal basis,” wrote Tim Eller, executive director of the Keystone Alliance for Public Charter Schools. In addition to his proposed education increases, Wolf wants to boost spending for a number of other priorities — all while addressing the state’s $2 billion structural deficit. “I did not run for this office to be party to the corner cutting and budget gimmickry that got us into this mess. We can’t afford to play political games while this crisis is casting such a dark shadow on our future,” said Wolf. To pay for the package, Wolf called for a slate of tax increases — including added levies on personal income (from 3.07 percent to 3.4 percent), bank shares, insurance premiums, natural gas drilling and cigarettes. The list of items eligible for sales tax would also expand. The Wolf administration called its income tax proposal “modest,” saying it puts less of a burden on the most vulnerable Pennsylvanians than the alternative. “By not addressing the multibillion-dollar deficit, Republican lawmakers will force school districts to raise property taxes on middle-class families and seniors. This is the Republican tax increase plan. 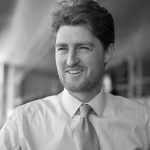 Billions of dollars in property tax increases to hardworking Pennsylvanians due to their refusal to address Pennsylvania’s deficit,” wrote spokesman Jeffrey Sheridan. Standing at the foot of the Capitol steps before the House GOP caucus, Speaker of the House Mike Turzai, R-Allegheny, denounced Wolf’s plan, saying it does not have the support of the state’s middle class. House Appropriations Chairman William Adolph, R-Delaware, pushed back against the doom and gloom of Wolf’s speech — advocating a middle path between a wave of new taxes and bankrupty. Senate Republicans criticized Wolf’s plan as well. Through a year of negotiations, they’ve maintained that they will not agree to a large education funding boost or tax increase without reworking the state pension system to take some of the market risk away from taxpayers by partly reducing guaranteed payouts. Wolf has said he’d agree to this, but the proposal has not gained traction in the state House among any Democrats and many Republicans — causing the “framework” agreement to collapse in mid-December. Wolf signed a budget in late December that included a Republican-backed education spending boost that fell well short of his goal. Wolf authorized only six months worth of school spending and slashed other budget items in an attempt to leverage Republican leaders into striking a grand bargain. As compromise continues to evade lawmakers, many school districts will again consider taking on more loans as they question whether they can stay open through the rest of the year.